The loss of primary teeth in individuals may compromise esthetics, function, and guidance of the erupting permanent dentition. When restoring primary teeth, dental professionals seek to restore oral function such as speech, mastication, dental anatomy as well as esthetics. Various types of restorative materials and crowns have been used to restore grossly decayed primary and permanent teeth both. These include amalgam, resin-based composite restorative material, preformed stainless steel crowns (SSCs), polycarbonate crowns, and strip crowns. The strip crown form, resin-based composite restoration, now allows the reconstruction of even the most badly decayed primary incisors and their use to restore posterior teeth also has been reported, However, the use of strip crowns in posteriors is not as popular as it is in anteriors, probably because of the associated technique sensitivity compared to prefabricated SSCs. In severely damaged primary molars and young permanent molars, the preformed SSCs are considered, in most of the cases as the best treatment option and have been most widely used since the 1950s. They are intended mainly to restore hypoplastic teeth, teeth with extensive caries, teeth after pulpotomy or pulpectomy, and when teeth become brittle and are prone to fracture. Preformed SSCs have improved over the years: better luting cements have been developed, and different methods of crown manipulation have evolved. Despite the favorable qualities mentioned, SSCs have a major drawback of poor esthetic appearance. One of the modifications of preformed SSCs used for restoring badly broken down primary posterior teeth are the commercially available preveneered SSCs, but they have disadvantages of being bulky, with no or limited ability to crimp and contour the facial surface. Thus, the composite facings can fracture and wear over time, thereby reducing esthetics and gingival health. Several esthetic improvements of SSCs with chairside procedures have been developed and used. Some of these procedures are the open face technique, sandblasting the preformed SSC, making retentive grooves on the SSC surface, soldering metal cleats, and the use of micromesh on the surface of SSC to be veneered., Hence, this study was planned to clinically evaluate and compare the success of preformed SSCs in which esthetic modification was done using three different techniques of veneering using composite resin. The null hypothesis supposed in the present study was that all three techniques of veneering are similar in success rates. The study was carried out in the Department of Paediatric Dentistry, SRDC, Faridabad, after obtaining ethical approval from the committee of the institution. This preliminary study for the clinical evaluation and comparison of three different techniques for veneering primary SSCs using composite resin was conducted on sixty primary preformed SSCs (maxillary and mandibular) which were placed on primary molars indicated for SSC. A total of 60 primary molars selected from patients between the age group of 4–9 years were randomly allocated to three groups having 20 samples using systematic randomization each with a parallel design of the study. 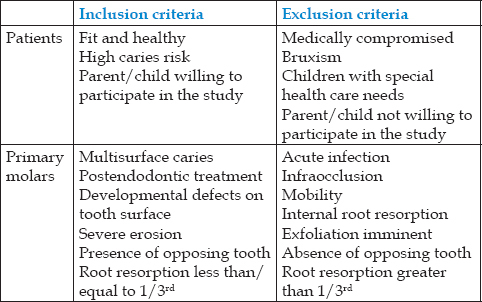 Inclusion and exclusion criteria were defined as shown in [Table 1]. Group C comprised of 20 primary SSCs with retentive grooves which were veneered using composite resin [Figure 3]. Patient and parents were explained about the study and written informed consent was taken from the parents. Preoperative radiographs (intraoral periapical) and clinical photographs were taken. For all three methods, tooth preparation was done in the usual manner, crown was adapted and occlusion was verified before final cementation. In the first visit, SSCs were adapted and cemented on the prepared tooth using glass ionomer luting and lining cement (GC Gold Label). The second visit was scheduled after 2 days. In the second visit, the patient was asked for any discomfort felt and an observation was made for any alteration in the occlusal anatomy of the cemented preformed SSC and a clinical photograph (Occlusal Surface) of the SSC was taken to note the same. Isolation of the tooth was done using rubber dam. 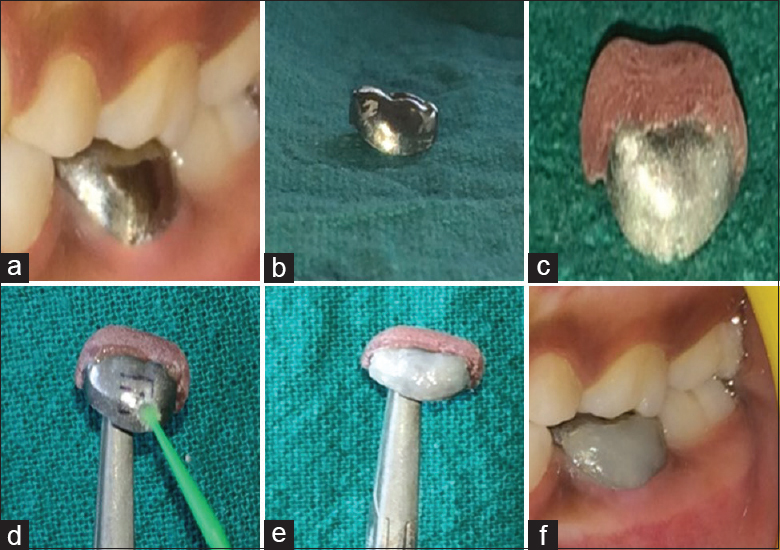 A window was prepared on the buccal surface of the SSC using tapering fissure diamond bur ISO 160/012 (Mani TC-26), leaving 1 mm margin on all four sides (mesial, distal, occlusal, and gingival) of the SSC and the underlying tooth was made visible by completely removing the surface-luting cement. The exposed tooth structure was then etched using 37% phosphoric acid for 15 s, washed, and dried. Using a disposable applicator tip, the bonding agent (Single Bond Universal Adhesive, 3M, 7th generation) was applied as per the manufacturer's directions: directly on the entire exposed tooth surface and rubbed in for 20 s. Furthermore, bonding agent was also applied directly on the borders of the stainless steel window (without etching) in the same way as on the tooth surface. Care was taken to avoid any contact between adhesive and oral mucosa. A gentle stream of dry/compressed air was directed over the surface where the bonding agent was applied for 5 s until it no longer moved and the solvent evaporated completely. The adhesive was then polymerized using curing light for 10 s. Resin composite (Filtek Z350, 3M ESPE) was then placed incrementally and each layer was cured with visible light. The thickness of the placed esthetic material, together with the SSC was maintained approximately close to 1.5–2 mm. Care was taken to avoid the extension of the veneering material up to the gingival margin. Both the composite material and the gingival margin of the SSC were finished and polished using Sof-Lex discs. In the first visit, SSCs were adapted on the prepared tooth surface and cemented using temporary cement (Zinc Oxide-Eugenol). A clinical photograph (Occlusal Surface) of the cemented crown was taken. The second visit was scheduled after 2 days. In the second visit, the patient was asked for any discomfort felt and an observation was made for any alteration in the occlusal anatomy of the cemented preformed SSC. A clinical photograph (Occlusal Surface) of the SSC was taken to note the same. The SSC was then removed and its buccal surface was sandblasted using aluminum oxide particles (particle size of 250 μm, pressure 4 psi at a constant distance of 1.5 inches for 40 s). Using a disposable applicator tip, bonding agent (Single Bond Universal Adhesive, 3M, 7th generation) was applied directly on the entire sandblasted SSC surface as per the manufacturer's directions, i.e., without etching the metal surface and rubbed in for 20 s. A gentle stream of dry/compressed air was directed over the surface where the bonding agent was applied for 5 s until it no longer moved and the solvent evaporated completely. The adhesive was then hardened using curing light for 10 s. Composite resin (Filtek Z350, 3M ESPE) was then applied incrementally on the buccal surface – leaving 0.5 mm of SSC exposed next to the gingival area – and was polymerized. The thickness of the placed esthetic material, together with the SSC, was maintained approximately close to 1.5–2 mm. Care was taken to see that the veneering material did not extend up to the gingival margin. The bonding procedure was carried out within 30 min of sandblasting. Both the composite material and gingival margin of the SSC were finished and polished with Sof-Lex discs. The SSCs were then cemented using Glass ionomer luting and lining cement (GC Gold label). In the first visit, SSCs were adapted and cemented with glass ionomer luting and lining cement (GC Gold Label). A clinical photograph (Occlusal Surface) of the cemented crown was taken. The second visit was scheduled after 2 days. In the second visit, the patient was asked for any discomfort felt and an observation was made for any of the alteration in the occlusal anatomy of the cemented preformed SSC. A clinical photograph (Occlusal surface) of the SSC was taken to note the same. 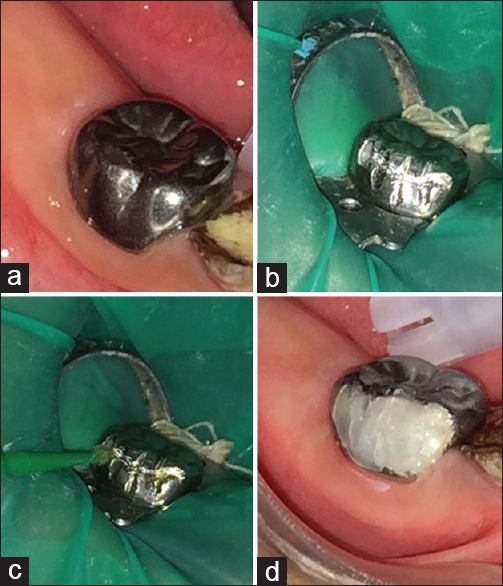 The tooth with the SSC was then isolated using rubber dam. On the buccal surface of the SSC, four parallel grooves in the occlusogingival direction and one groove horizontal to these vertical grooves, in the mesiodistal direction (in the midline of the tooth mesiodistally), were prepared for retention by means of a diamond straight fissure bur ISO 111/012 (Mani SF-11) using light strokes taking care that the cemented crowns are not perforated. Using a disposable applicator tip, bonding agent (Single Bond Universal Adhesive, 3M, 7th generation) was applied directly on the entire buccal surface of SSC (without etching) and rubbed in for 20 s. Care was taken to see that contact between adhesive and oral mucosa was avoided. A gentle stream of air was directed over the metal surface where the bonding agent was applied for 5 s until the agent no longer moves and the solvent evaporated completely. The adhesive was then polymerized using curing light for 10 s. Composite resin (Filtek Z350, 3M ESPE) was then applied incrementally on the buccal surface – leaving 0.5 mm of metal exposed next to the gingival area – and was polymerized using curing light. The thickness of the placed esthetic material, together with the SSC, was maintained approximately close to 1.5–2 mm. Care was taken to see that the veneering material did not extend up to the gingival margin. Both the composite material and gingival margin of the SSC were finished and polished with Sof-Lex discs. Postoperative care and routine oral hygiene instructions were given to all the patients. 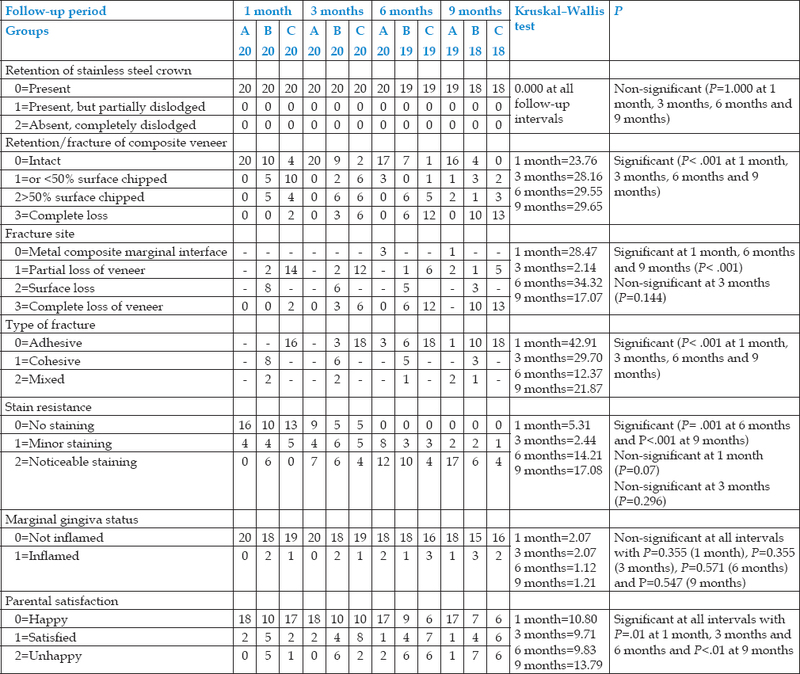 Children were followed up over the next 9 months – first at the end of the 1st month and then at an interval of 3 months (i.e., at 3, 6, and 9 months) as per evaluation criteria [Table 2]. The findings at each time interval were noted, tabulated, compared, and subjected to statistical analysis using SPSS (IBM SPSS Statistics for Windows, Version 22.0. Armonk, NY: IBM Corp) statistical analysis software. The Kruskal–Wallis and ANOVA tests were used. [Table 3] shows the follow-up results of three groups over a period of 1, 3, 6, and 9 months. There was a drop out of 1 from the open window group, 2 from the sandblasting group, and 2 from the buccal grooves group at the end of 9 months. No failures were observed in Group A in the first 3 months, and at the 6th month follow–up, 3 out of 20 crowns showed <50% chipping and at the end of 9 months, 2 out of these 3 cases showed little more loss of veneer, resulting in >50% loss of veneer and the 3rd case remained the same. All three fractures observed at the end of 6 months were at the metal composite marginal interface, i.e., adhesive type of fracture. At the 9th month follow-up, in 2 out of these 3 cases, fracture extended within the composite veneer-mixed type of fracture and 16 veneers were intact. Of all veneered crowns, maximum crowns – 17 out of 19 showed a gradual increase in staining over the 9 months with noticeable yellow staining of the composite veneer. In Group B, at the end of 1 month, 10 out of 20 cases showed loss of composite veneer: 5 cases each showed <50% and >50% loss of the veneer. There was a complete loss of the veneer in 3 out of 20 cases, 6 out of 19 cases, and 10 out of 18 cases at the end of 3rd, 6th, and 9th month, respectively, thus showing an adhesive type of fracture, such that only four veneers were intact at the end of the study. 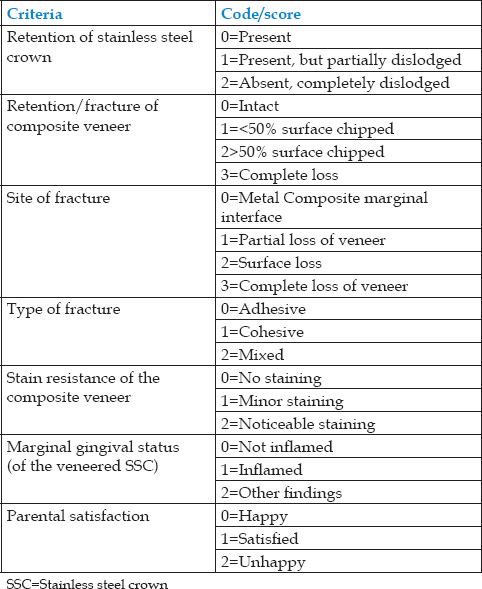 Surface loss of the composite veneer was seen in 8, 6, 5, and 3 cases at the end of 1, 3, 6, and 9 months, respectively: indicating cohesive type of fracture in these cases. In Group C, only four veneers were intact at the end of 1 month, 10 showed >50% surface chipped, 4 showed <50% surface chipped, and 2 showed complete loss of the veneer: all cases indicating adhesive failure. A progression was seen in the loss of composite veneer such that, at the end of 9 months, no veneer was intact, two cases showed <50% chipped surface and three cases showed >50% surface chipping. Thus, at the end of the study, five cases showed partial loss of the composite veneer and rest of the 13 cases showed complete loss of veneer all crowns thus all showing adhesive fracture. Esthetic SSCs are essentially SSCs with a composite or porcelain coating that is chemically or mechanically attached to a metal coping where the composite is used to hide the metallic appearance of the base structure. However, esthetic SSCs have several shortcomings relative to SSC restorations. They require a greater reduction of tooth structure during preparation than is the case for traditional SSCs. In addition, esthetic SSCs are expensive, cannot always be crimped to fit to the prepared tooth, and repair of fractured coatings may entail complete replacement. There is also a greater need for occlusal reduction for placing esthetic SSCs, which can increase the risk of exposing vital pulp. The shape of an esthetic SSC cannot be altered, because this would change the rigid metal coping structure beneath the somewhat brittle composite, leading to the possibility of future fracture. For all three methods, tooth preparation was done in the usual manner including adaptation, occlusion verification: the standard procedure was done till the SSC was ready for cementation. For 20 cases each of open face technique and buccal grooves, the crown was cemented using glass ionomer luting and lining cement (GC Gold Label), and for the 20 sandblasted crowns, luting was done using a temporary cementing media: zinc oxide eugenol. The patient was thereafter recalled for the 2nd visit; after 2 days, changes in the occlusal anatomy were verified and the buccal surface preparation and veneering were done. The preformed 3M SSC used in the study exhibits an anatomy similar to that of the primary teeth, but it is not exactly the same as the primary tooth replaced. Moreover, masticatory forces play an important role in the occlusal anatomical changes that occur in the cemented primary molar SSC. The force generated during routine mastication of food such as carrots or meat is about 70–150 Newton (16–34 lbf). The maximum biting force is around 500–700 Newton (110–160 lbf). These forces may cause changes in the occlusal morphology and also influence the veneer retention. Since in the present study, the retention of the composite veneering was to be evaluated; therefore, the veneering of the buccal surface of the cemented SSC was done after 2 days, when the occlusion has somewhat stabilized and adjusted. The investigator observed changes in the occlusal anatomy observed in 20 of the 60 crowns. These findings can be corroborated with those of Gallagher et al., who found maximum intercuspation position was disturbed by the placement of a SSC in seven of twenty cases studied and in most cases returned to preoperative status within 4 weeks of crown placement. The technique used for the buccal surface preparation for both open window and buccal grooves is similar to the method used by Yilmaz and Kocogullari  but with certain following modifications: first, in the present study, the window was prepared in the 2nd visit, whereas in the technique used by Yilmaz and Kocogullari, the window preparation was carried out in the 1st visit which was then covered by a temporary restorative material. Second, preparation of buccal grooves and veneering was done intraorally on the cemented SSC in the 2nd visit in our study as compared to extraoral preparation of the buccal surface of the SSC by Yilmaz and Kocogullari. Furthermore, in the present study, window and buccal grooves' preparation was done using tapering fissure diamond bur ISO 160/012 and diamond straight fissure bur ISO 111/012, respectively, instead of a diamond round bur no. 12. However, buccal grooves should be prepared carefully with bur else it may result in perforation of the crown. After the window preparation, the GIC luting cement left on window area was removed using hand or rotary instrument to expose the underlying tooth structure. Apart from bonding agents, various surface treatment options can be used to enhance the bond strength between the SSC surface and the composite veneering, of which sandblasting is one which is easily available and not technique sensitive. Sandblasting of the metal surface can be done using alumina oxide of varied particle size (25, 80, 110, and 250 μm) at a specific pressure for a particular period of time: which results in the exposed metal surface to have dull frosty appearance. Gomes et al. quoted that although no study has been found on the effect of the sandblasting particle size on the bond strength to zirconia and stainless steel, an investigation on the optimal surface treatments for carbon/epoxy composite adhesive joints concluded that the surface roughness, eroded length, and eroded depth increased as the particle size of sandblasting increased, as rough surfaces increase the area of the adhesive joint and the effect of interlocking. For sandblasting, the temporarily cemented SSC was removed after 2 days using a small spoon excavator on the lingual side such that the marginal adaptation on the buccal side was not much altered. The buccal surface of the removed SSC was sandblasted using aluminum oxide particles size of 250 μm, under pressure of 4 psi at a constant distance of 1.5 inches for 40 s. The procedure of veneering was carried out extraorally and immediately as McCaughey  found that strength of sandblasted metal was affected adversely by more time interval between sandblasting and bonding composite. All 60 SSCs were retained at the end of the study. This is in accordance with a study conducted by Roberts et al. (2005) where SSCs whose maximum and mean follow-up period was 7.69 and 2.13 years, respectively, showed a success of 97%. In the present study, the retention/fracture of the veneer was assessed according to the classification given by Leith and O'Connell  and the type of fracture was recorded as adhesive, cohesive, and mixed as described by Yoshida et al. The open window technique showed a success rate of 84.2% (16 out of 19 veneers intact at the end of 9 months) which was in accordance with the study conducted by Yilmaz and Kocogullari, who found that crowns veneered with the open window technique had a success of 95% at the end of 18 months. The high success rate for this technique may be attributed to (1) chemical bonding of resin to tooth; (2) use of dentin bonding agent: single bond universal, a self-etch, and total etch adhesive. Yoshida et al. showed that self-etching adhesives that utilize 10-methacryloyloxydecyl dihydrogen phosphate form self-assembled nanolayers at the tooth-bond interface, which could be the reason for their higher bond strengths to tooth; and (3) phosphoric acid etching: following the manufacturer instructions, the prepared tooth structure was etched and the metal surface was not etched before application of bonding agent. therefore, etching and use of bonding agent both may result in greater bonding of the composite resin with the tooth. In cases where sandblasting was done before veneering, the success rate at the end of 9 months was approximately 25% (4 of 18 cases showed a completely intact veneer). Complete adhesive failure was seen in ten cases: majority of which showed cohesive failure and a few had partial adhesive failure initially which then progressed to complete adhesive failure. These findings are similar to those found by Hattan et al., who used another universal bonding agent (scotch bond universal adhesive) for composite veneering in 20 sandblasted crowns, and on in vitro testing using a universal testing machine found adhesive, cohesive, and mixed type of failure in 9, 2, and 9 cases, respectively. Another in vitro study conducted by Khatri et al. for the evaluation of bonded conventional and nanocomposite resin on sandblasted anterior SSCs using the bonding Prime and Bond NT revealed that, in the conventional composite group, the fracture site distribution observed was adhesive failure 6 (40%), cohesive failure 6 (40%), and combined failure 3 (20%), and in the nanocomposite group, the fracture site distribution observed was adhesive failure 6 (40%), cohesive failure 4 (26.66%), and combined failure 5 (33.34%). Therefore, in both these studies, the percentage of cases exhibiting adhesive failure is similar to what is seen in the present study (55.5%). On comparing veneer retention in sandblasting and buccal grooves techniques, veneer was retained in more cases of sandblasting as compared to grooves and this better outcome may be attributed to the complete surface preparation by sandblasting as compared to placement of five grooves at a distance in the 3rd group to aid in the retention of the veneer along with the universal bonding agent used. Salama and el-Mallakh  in an in vitro study found that the mean shear bond strength of sandblasted SSC bonded to Dyract (a compomer resin material) was 9.518 MPa as compared to compomer bonded directly to the metal surface (shear bond strength of 2.998 MPa). Apart from the aforementioned reasons for the better retention of the veneer in the open window technique, another reason may be that metal (thickness of 0.2 mm) is not removed from the buccal surface in cases of sandblasting and buccal grooves and although an attempt has been made to maintain the thickness of the veneer at 1.5–2 mm approximately, greater thickness at the buccal surface in these groups might lead to overcontouring of the restoration and thus result in greater cases of veneer fracture. Almost all composite veneers which were retained showed gradual yellow staining over the period of the study. The staining gradually increased in intensity over the period of 9 months. This yellow staining can be attributed to food, mainly turmeric that is used extensively in almost all preparations mainly in this part of the country. This was in accordance with a study conducted by Yew et al., who conducted a study to evaluate color stability of a resin composite upon exposure to spices: turmeric, paprika, and tamarind and found that the highest color deviation was obtained in the turmeric group. Another reason for the noticeable yellow staining can be improper oral hygiene maintenance and therefore plaque accumulation. The gingival health around the crowns was optimal in most cases during the duration of the study. A total of 6 cases in all groups (1 case – open window, 3 cases – sandblasting, and 2 cases – buccal grooves) showed slight gingival marginal inflammation, i.e., reddening of the gingiva around the crown at the end of the study. This inflammation may be attributed to retentive areas for plaque accumulation on the veneer which were a result of chipping of the same, more so at the borders of the veneer, and patients following an improper method of brushing. The rough edges of the veneer were smoothened and oral hygiene and brushing instructions were reinforced at subsequent visits. There were several limitations associated with the study, the most important being the short follow-up. However, considering that SSCs were retained in 100% of the cases with veneer failure in all groups and presence of staining in composites veneers, the patients might tend to ask for replacement of the composite veneers as they might be dissatisfied with the esthetics and hence this study might be clinically relevant considering 9-month follow-up. Blinding of the operator is not possible in such clinical trials which theoretically might create a source of bias. In the present study, the open window technique of veneering showed maximum retention of composite veneers; therefore, the highest level of parental satisfaction. To conclude, based on the present study, open window technique of veneering SSCs can be adjudged as the best method of veneering SSCs for esthetic purposes. The most common fracture type was adhesive seen at the metal composite interface. Gradual yellow staining of the composite veneer was seen over the period of the study. Most cases showed an optimal gingival health at the end of the study. Though all the 3 techniques used to provide a chairside and easy method for esthetic modification of the SSC, the open window is the most successful of the three methods of veneering. Ram D, Fuks AB, Eidelman E. Long-term clinical performance of esthetic primary molar crowns. Pediatr Dent 2003;25:582-4. Helpin ML. The open-face steel crown restoration in children. ASDC J Dent Child 1983;50:34-8. Salama FS, el-Mallakh BF. An in vitro comparison of four surface preparation techniques for veneering a compomer to stainless steel. Pediatr Dent 1997;19:267-72. Beattie S, Taskonak B, Jones J, Chin J, Sanders B, Tomlin A, et al. Fracture resistance of 3 types of primary esthetic stainless steel crowns. J Can Dent Assoc 2011;77:b90. Scully C. Oxford Handbook of Applied Dental Sciences. 1st ed. Oxford: Oxford University Press; 2002. p. 156. Gallagher S, O'Connell BC, O'Connell AC. 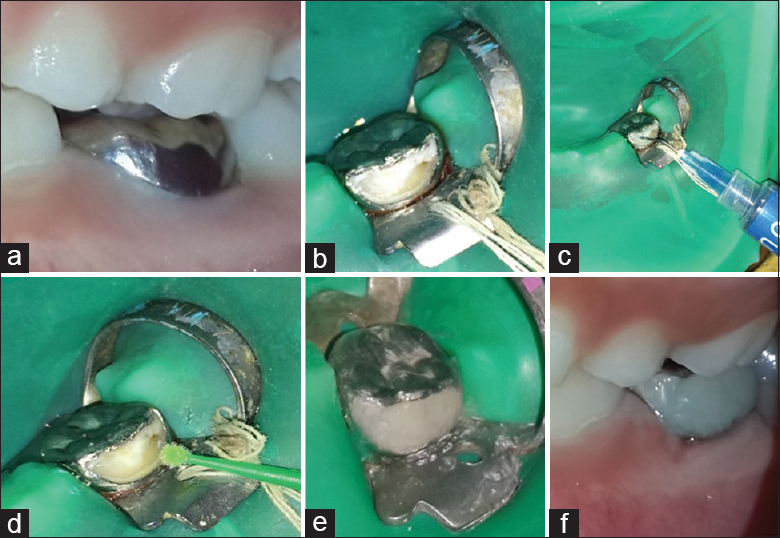 Assessment of occlusion after placement of stainless steel crowns in children – A pilot study. J Oral Rehabil 2014;41:730-6. Yilmaz Y, Koçoğullari ME. Clinical evaluation of two different methods of stainless steel esthetic crowns. J Dent Child (Chic) 2004;71:212-4. Gomes AL, Castillo-Oyagüe R, Lynch CD, Montero J, Albaladejo A. Influence of sandblasting granulometry and resin cement composition on microtensile bond strength to zirconia ceramic for dental prosthetic frameworks. J Dent 2013;41:31-41. McCaughey AD. Sandblasting and tin-plating-surface treatments to improve bonding with resin cements. Dent Update 1993;20:153-7. Leith R, O'Connell AC. A clinical study evaluating success of 2 commercially available preveneered primary molar stainless steel crowns. Pediatr Dent 2011;33:300-6. Hattan MA, Pani SC, Alomari M. Composite bonding to stainless steel crowns using a new universal bonding and single-bottle systems. Int J Dent 2013;2013:607405. Khatri A, Nandlal B, Srilatha M. Comparative evaluation of shear bond strength of conventional composite resin and nanocomposite resin to sandblasted primary anterior SSC. J Indian Soc Pedod Prev Dent 2007;25:82-5. Yew HZ, Berekally TL, Richards LC. A laboratory investigation of colour changes in two contemporary resin composites on exposure to spices. Aust Dent J 2013;58:468-77.